The Spring/Summer 2014 Rowan Magazine 55 really excelled at one thing: stripes. I mean, there's a gazillion striped things in there: 24 out of 38 designs! I already made one of them and had a great time doing it: my Dollaramy Sally. My next choice was Wharf by Gemma Atkinson. 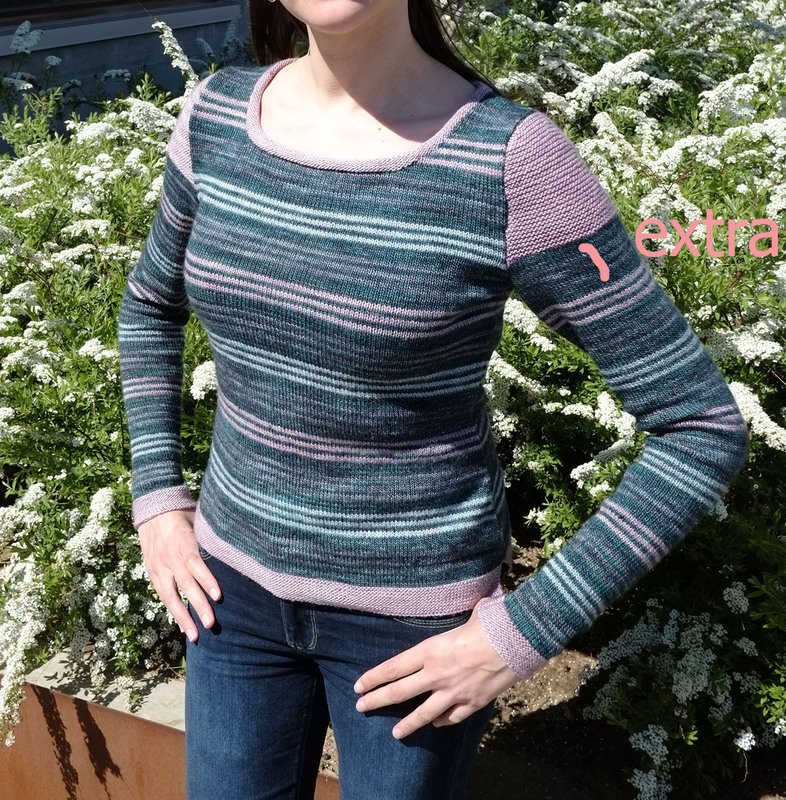 I especially loved the little garter stitch shoulders that gave the piece a little bit of zing -- I have a thing for highlighted shoulders. 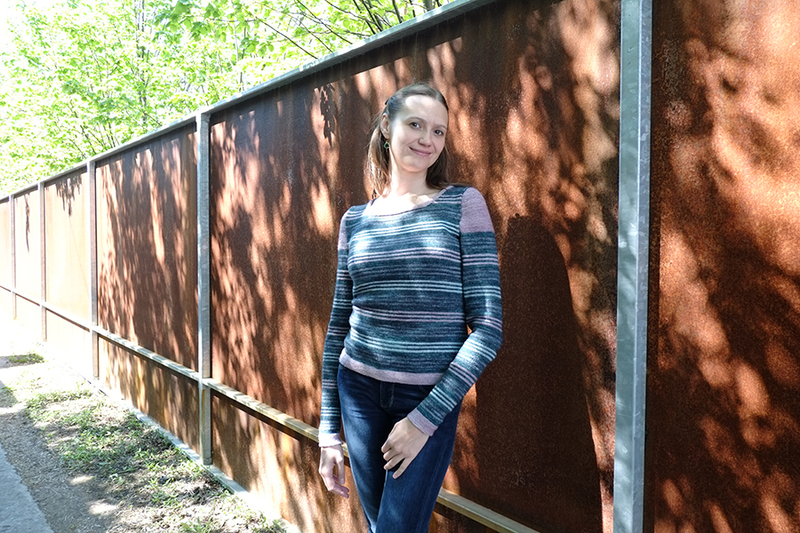 See my post about my Buckland sweater, here. 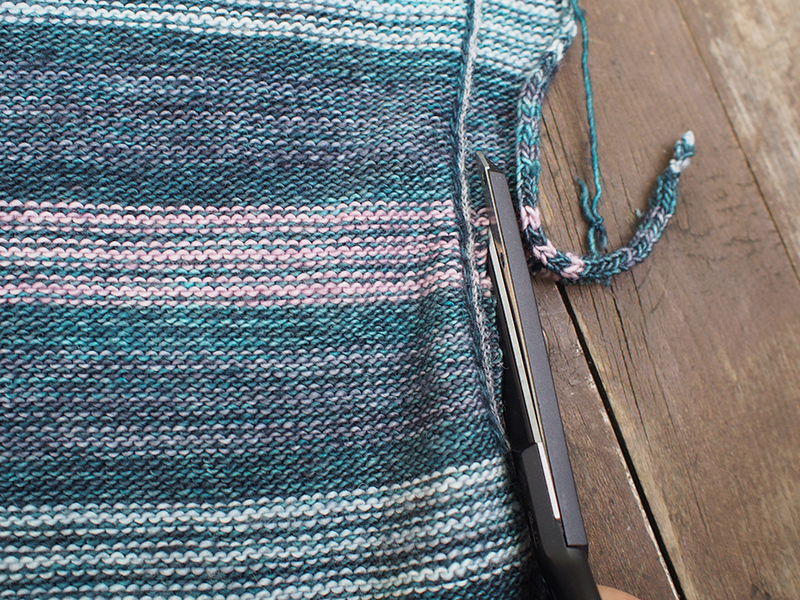 Stripes are really good for stashbusting as you can get away with using less yarn. But it also can lead to stashaugmenting (new word) because you really want the very perfectest colors to stripe together. Oops, that will be MY story. 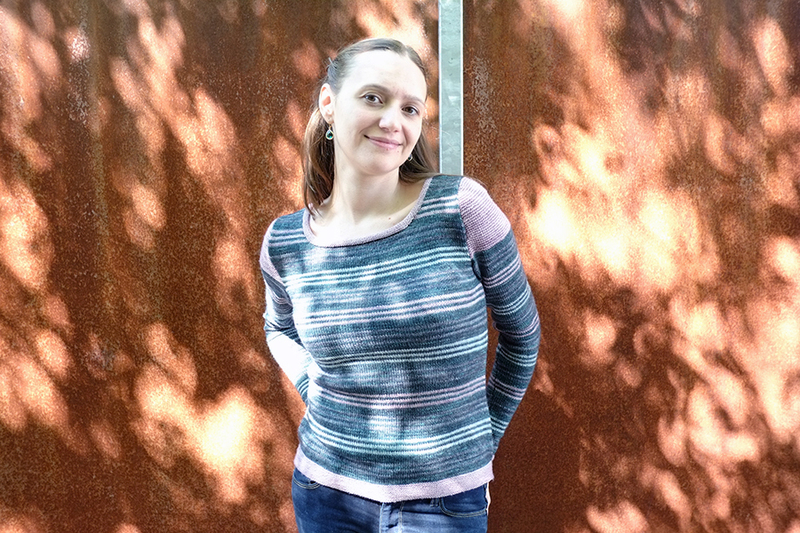 See my Julia Sweater on Ravelry, here. Swatching it revealed that the Dr. Zhivago's Sky gray was very close to the Manor... 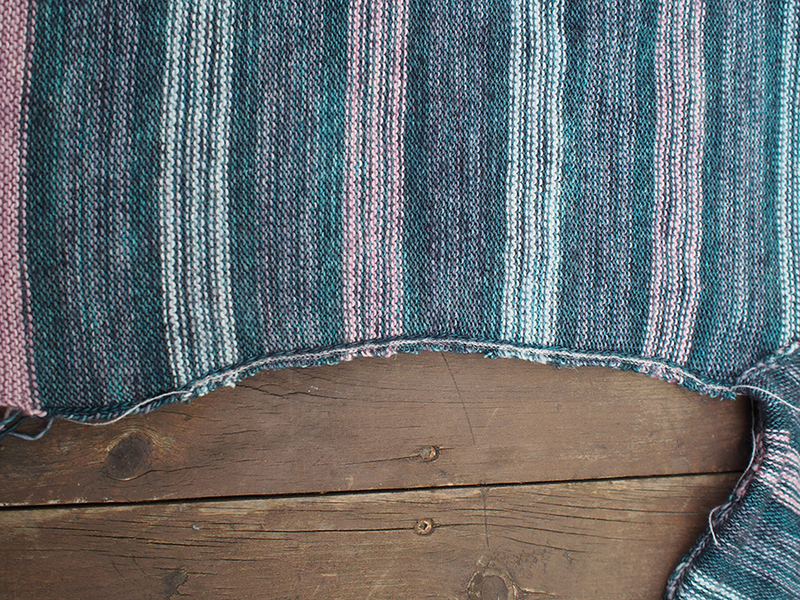 I hemmed and hawed and in the end decided that a subtle stripe would be cool. HINT: to see how a swatch looks on, tie it on your arm with rubber bands! 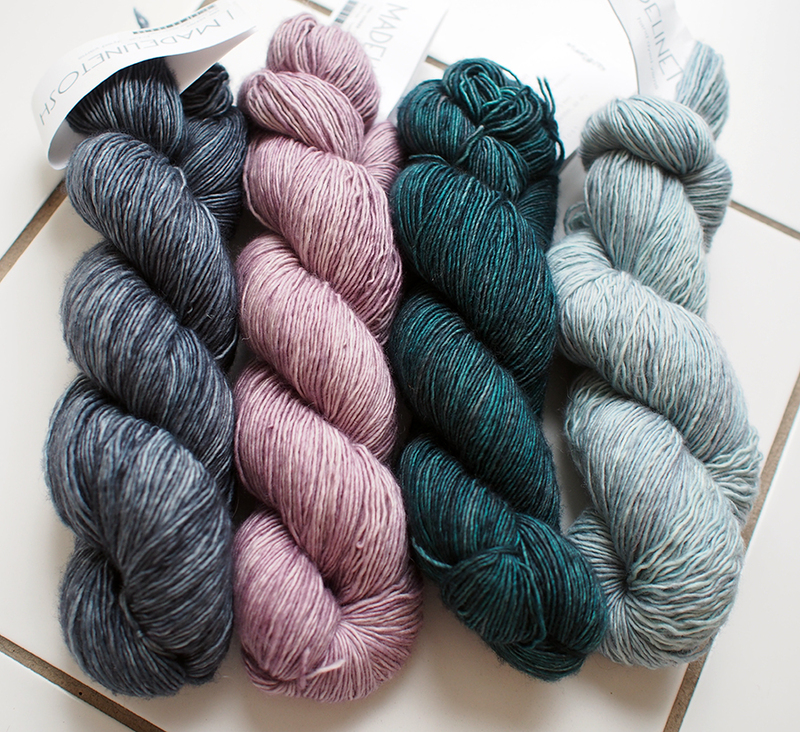 So if we add it all up: STASHBUST WIN: Only 6 grams left of the main color, yeah! STASHBUST FAIL: I had to buy 3 extra skeins to get the color scheme I wanted, and now I have awkward amounts left of each. Stashbusting is like running on a hamster wheel, I swear. Yes, this hamster would make i-cord! 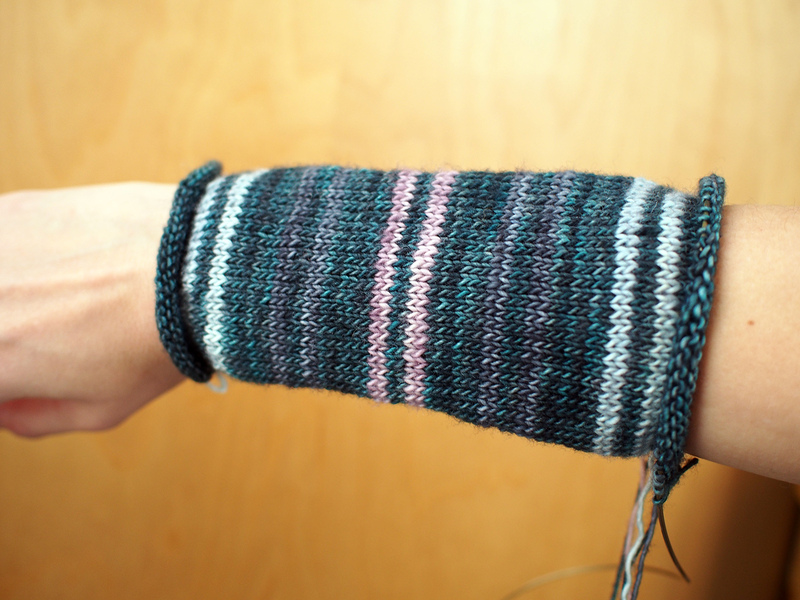 I changed the stripe pattern around a little, instead of a 1-2-3 pattern, I went for a 1-2-1-3 pattern. Of course, this brought me to Challenge #1. 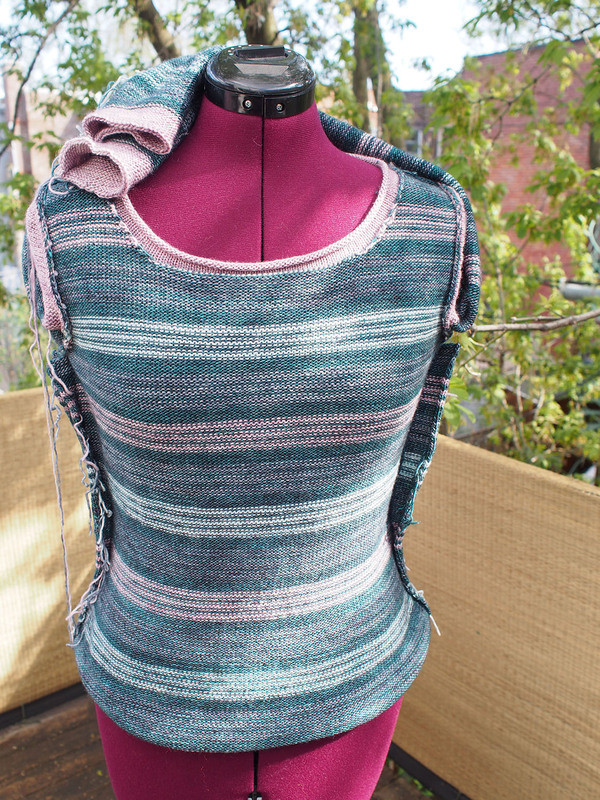 When I got to the armhole, the color I was on was pink -- but that was the color that I was supposed to use directly for the shoulder accent! Argh. 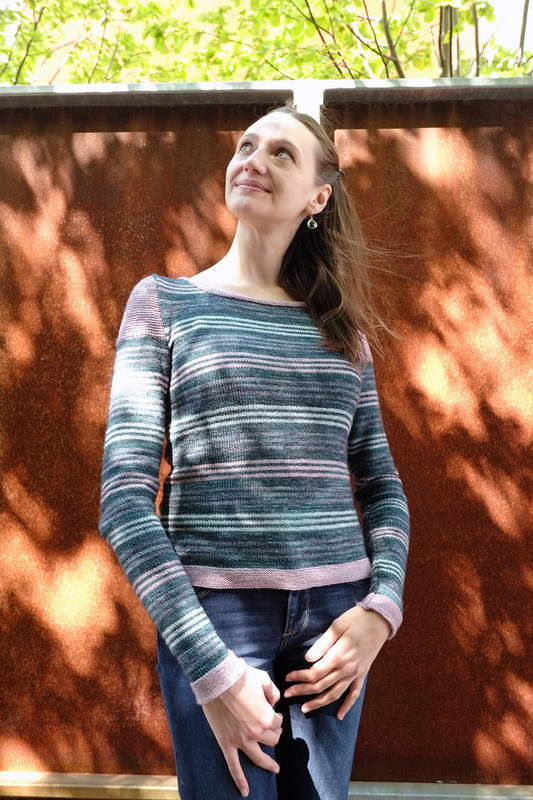 I decided to lengthen and knit the next color stripe pattern. The problem with this was that it lowered the location of the waist. Hmm. UGH!! I don't really know what happened here, but I am definitely leaning toward blaming the yarn for the most part (and maybe my lengthening too). It's a single-ply superwash and has already stretched for me in the past. Somehow the hip was ok, but the waist and bust were too large and were making a CHEST SACK when worn. Recently I described how I like to just sew my seams and chop off the excess. 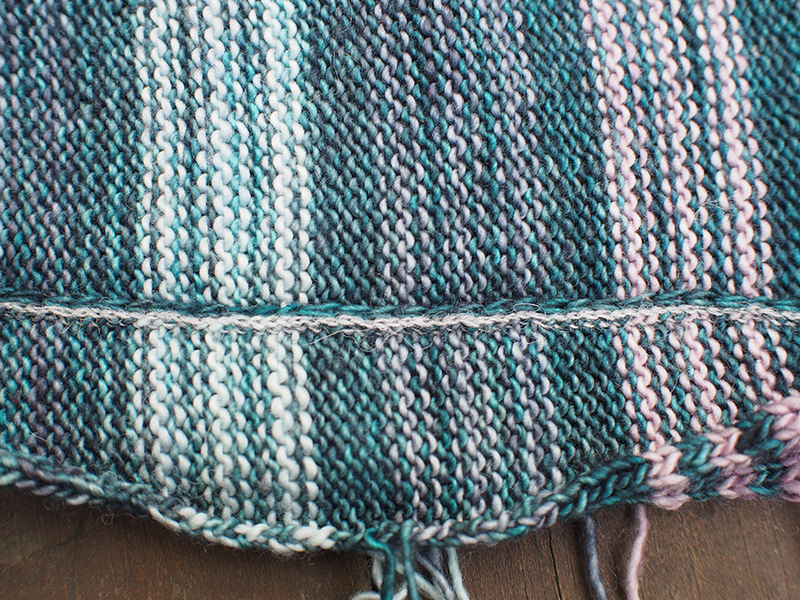 That time I made a slip-stitch crochet line (or steek) right next to the seam using the original yarn. 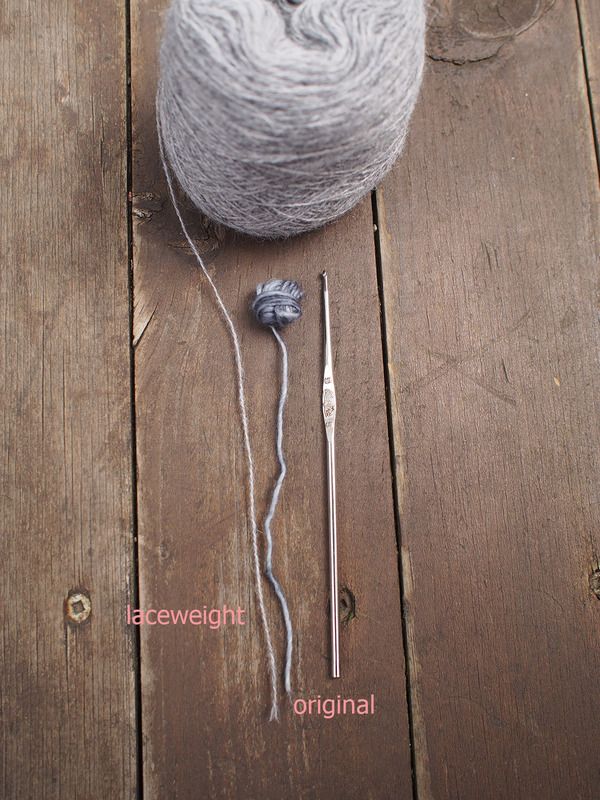 I found that was too bulky, so this time I used a laceweight yarn with some synthetics for a thin but strong boundary. The fit is really quite nice, now. I decided to leave the garter hem open on the sides, but am not sure if I will keep them that way, as it sort of rides up the back. 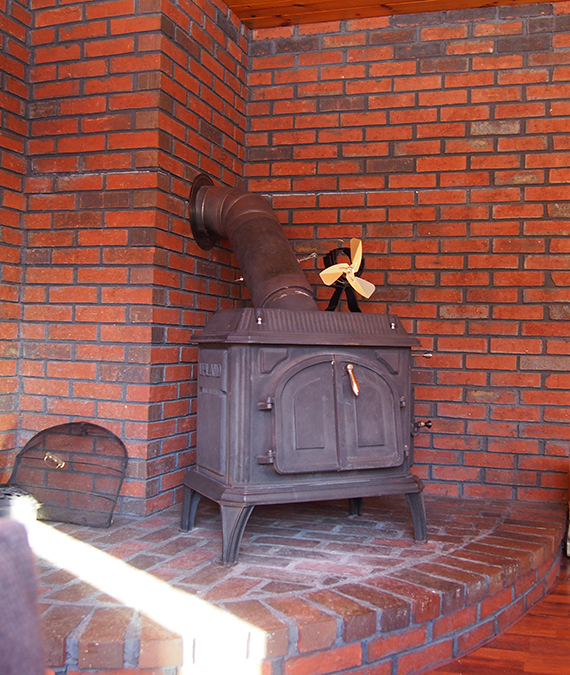 One of my favorite design elements of the sweater is the reverse stockinette rolling collar. I need to use this more often! Just use a smaller needle and it looks so darn neat. Remember the no-man's land Mars landscape from my last photo shoot? Well, Spring has definitely finally arrived. We ran into a hipster convenient store (a "dépanneur" in Montréal) that sells nice sandwiches and expensive pharmacy colas called Le Pickup. 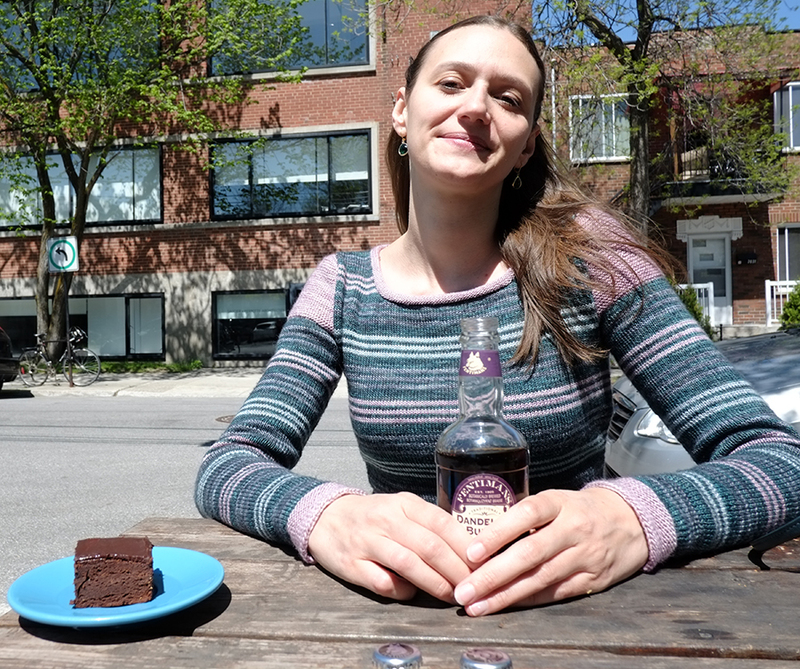 It was a lovely lunch and I highly recommend Dandelion Burdock soda, should you find it! We spent most of our time talking about Singapore, as my husband will be flying there for an interview in June. How different of a life would that be?! 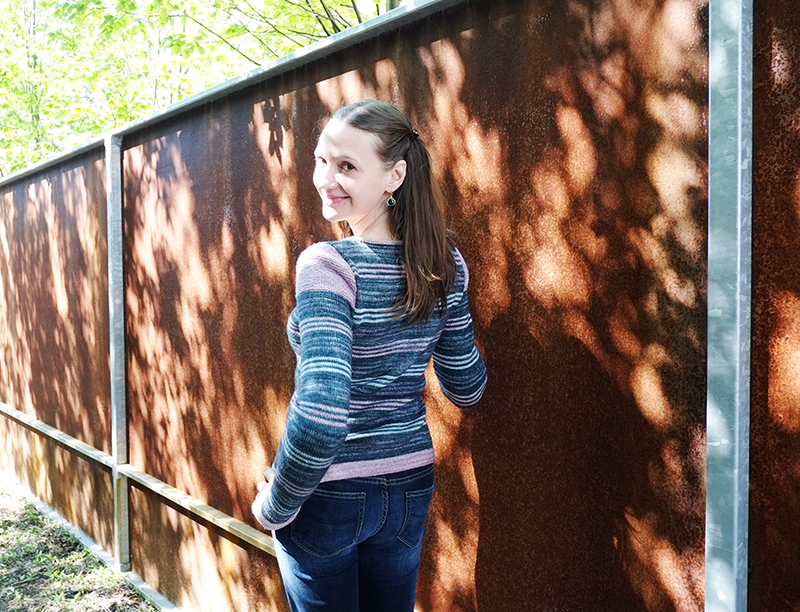 I tell you one thing, I would have made this pullover in cotton instead of merino wool! But then, another interview is in Bar Harbor, Maine... which is about the most opposite place from Singapore possible (geographically as well) and which requires Much Merino. Very interesting times ahead. Another great jumper. You must be a very fast knitter and how brave to cut your knitting to get a good fit. 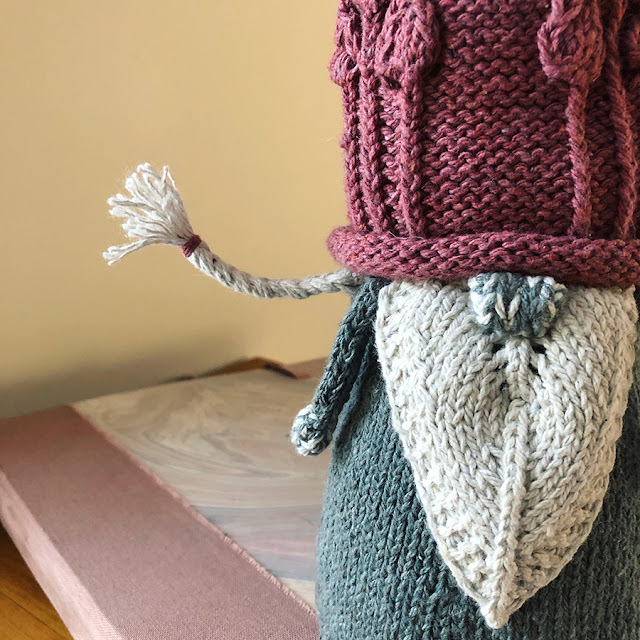 I don't know if I knit fast, but I certainly knit all the time! Thanks, Una. This came out really great and I love that you cut the excess fabric to make a better fit. I'd never noticed that collar in the pattern but you are right, it does look very neat. Wow, Singapore or Maine? Maine would definitely be better for knitting, but I do have to say I had the best food of my life in Singapore. It's been nearly 20 years since I visited, but I can still remember this huge satay market where there were about 40 vendors cooking and selling nothing but various types of satay. And then I had this dish of pounded out shrimp that was then rolled around sugarcane and eaten like corn on the cob. Hope all goes well with either option. Oh wow -- I might pick your brain in the future, should the need arise. The satay market sounds wonderful AND the shrimp. That has been the number one positive comment about Singapore, that the food is beyond compare! 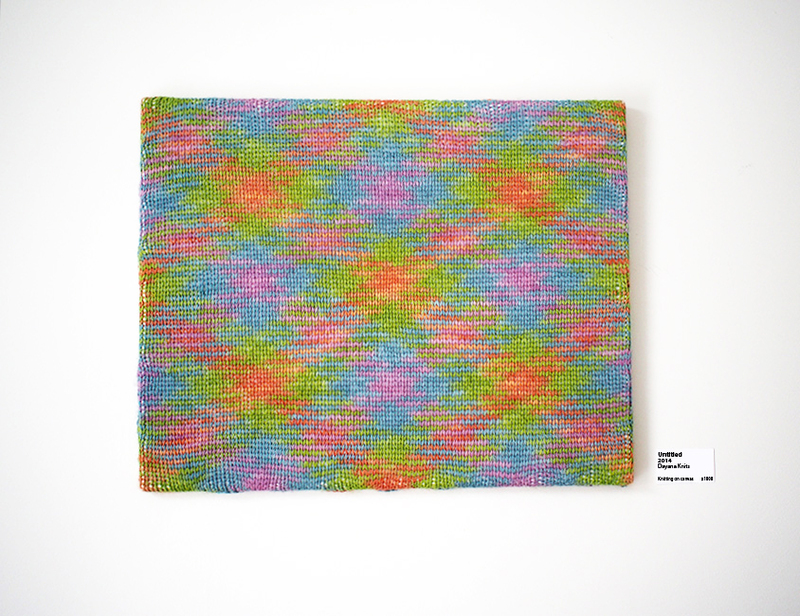 I'm thinking of this wool KAL blanket though -- would I have to give it away?? Lovely jumper! I love shoulders in pink and neck band is really neat. Thanks -- I'm so glad I picked pink for those elements. And I am from Maine, near Bar Harbor. The high school in Bar Harbor was my high school rival. Small world. What a great post. Thanks for the tip re the Rowan book of stripes. 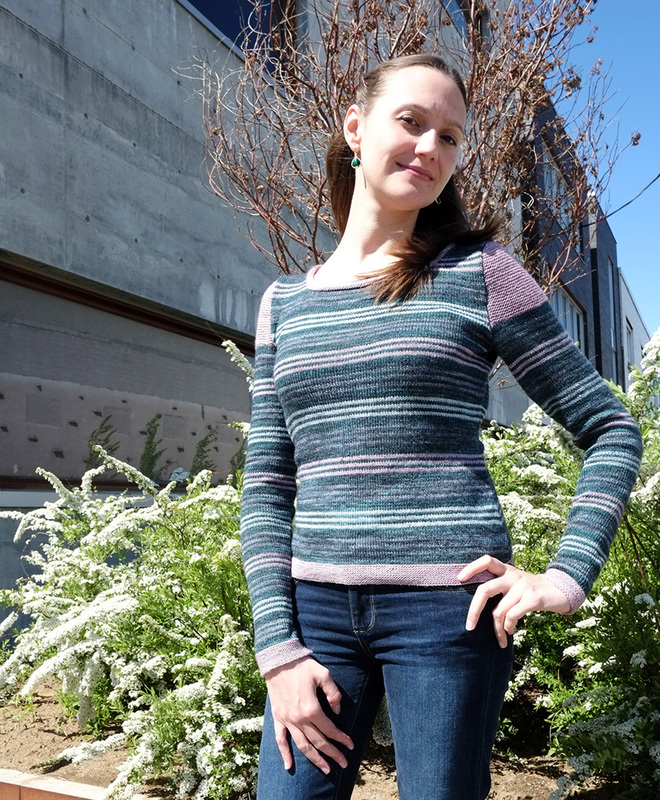 I love the striped tee and love too the great bargain on your yarn. 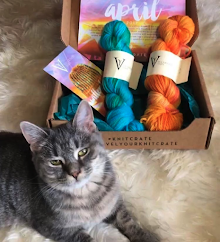 I've seen that yarn at my local Dollarama but haven't purchased any. Let us know how it wears. Ok, so I wore it just the other day -- not bad! It's pretty thick so rather warm. Otherwise, it looks the same as when in the ball, a little tweedy. What I was most worried about was the smell -- just like that horrible plasticky Dollarama smell, but I am happy to say it seems to have calmed down admirably. I recently discovered your blog and I'm so glad I did! I love your sense of style--and your fabulous knitting skills. Always learn something by reading your posts! You are so sweet! I'm so happy to have you as a follower. 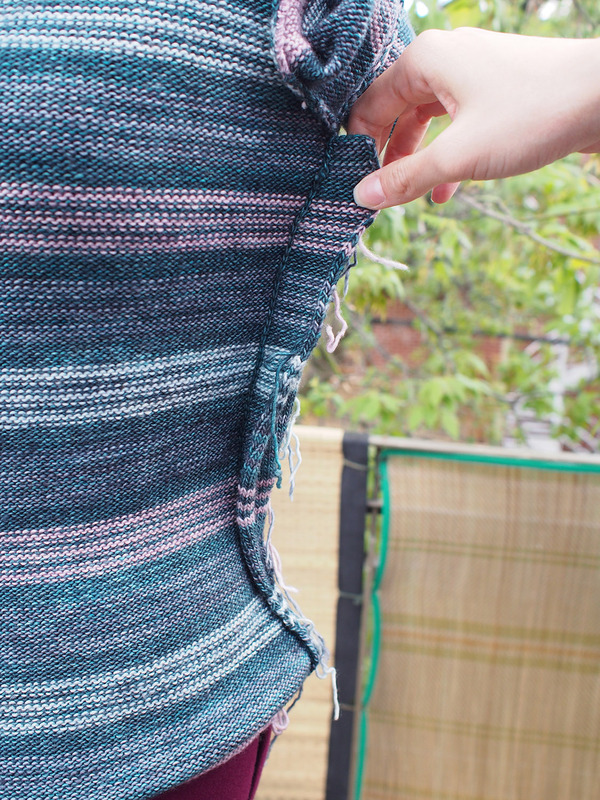 I love seeing how you can alter your knitted garments after the actual knitting for an improved fit! 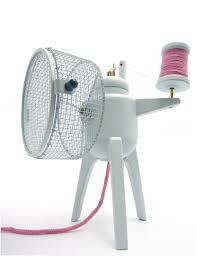 This is what I need to do for too many of my own knitted projects. Thanks for setting me such a good example - now I need to follow it. Maine would be good for knitting, but Singapore would be great for dining, as Blithe Spirit said above. I've dined in a Singapore-Indian restaurant (in California, not Singapore itself) and it's one of the loveliest cuisines I've ever encountered. If I think about all the garments I have, at least half need something "done" (mostly sleeve lengthening or shortening. But I find that if I don't do it during the actual finishing of the garment, I never do it. And I wanted to wear this one! It takes exactly the right mood to do it though, get into a zen moment, lol. As far as knitting in Singapore, sigh, yes. Maybe it would be time to take up tatting or lacy crochet! Seeing scissors that close to your knitting makes me horrified - I salute your bravery! Do the steeked fabric edges feel weird at all on the inside? Good question! No, they don't, they are much like the seams of any garment. It's important to steek/bind quite close to the seam though. 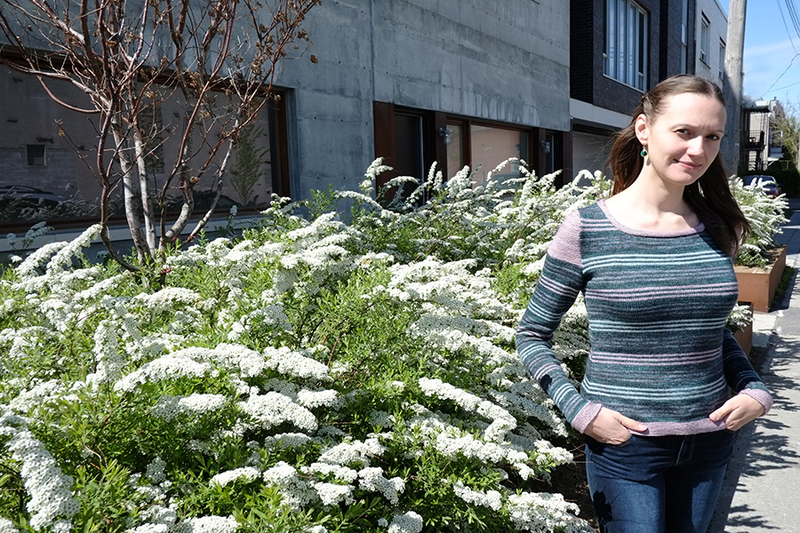 There I was, quietly enjoying the stripes (that colour scheme looks really good on you) and you hit me with Julia - OMG I LOVE that sweater! Ha! 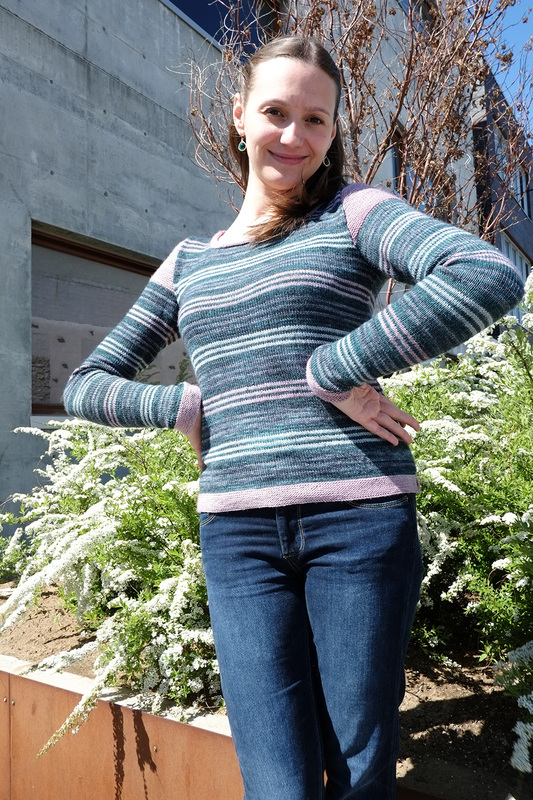 It's an excellent pattern, totally seamless from the bottom up, and the set-in sleeves are worked at the same time! 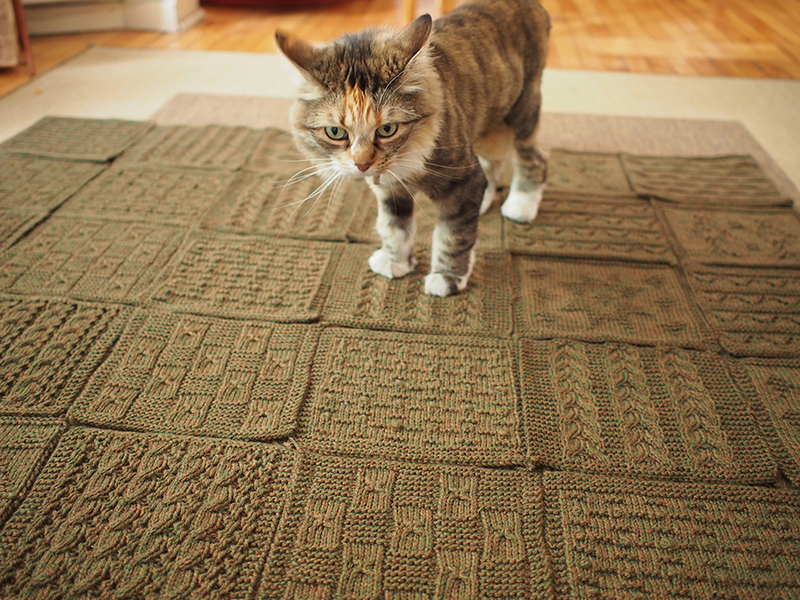 LOVE the roll-in purl collar, what an ingenious idea! I will have to try that out immediately! HA. Ok, that means I need a cat too, right? This cat that comes by isn't the least bit interested in toys, silly thing. Good luck with your husbands interview! My hubby is out doing the same ... We are looking at DC right now . The sweater is great ... Thanks for all the tips ! Oh, I love DC, worked there for 2 summers. Ok, so I was a poor student and lived in an apartment that had at least 5 species of... bugs. BUT I STILL LOVED THE CITY! Looks fantastic, and I agree, that neckline is so neat and lovely. 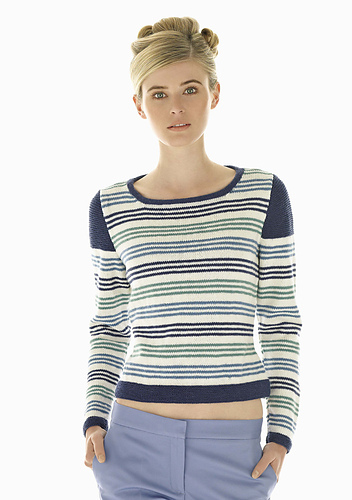 Another lovely sweater and I also love the neckline. Oh, I often have to give my sweaters a good sew and chop to make them fit! Sometimes the body, sometimes the sleeves, sometimes both. PS, don't go to Singapore, tooooooo far away! I vote for Bar Harbor! I'm just loving the colour palette you've used for this! Amigurumi for Nerds -- A Knitted Hearing Cell!